The Acer Aspire 1694 notebook is packed full of goodies to give you the productivity and entertainment at home or out and about. It has one gig of ram, a 100 gig hard drive and a slot loading dual layer DVD drive, that’s the new drive where the disk simply slides in. And it’s fitted with Intel Centrino mobile Technology. You’ll really enjoy watching DVD’s on this beauty because it has a 15 point four inch Crystal Brite panoramic display, and inside is a hefty 128 meg PCI Express video card. It also has a built in card reader making it easy to transfer photo’s from your digital camera and inbuilt Bluetooth for wireless connections. And talk about light, this notebook weighs less than 3 kilo’s. 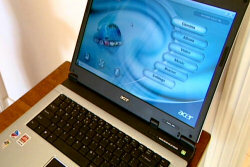 The Acer Aspire 1694 can be yours for only $2499.00.